Emma Frucht, a twenty-two-year-old native New Yorker, is a first-year violin Masters student at The Juilliard School, studying with Naoko Tanaka and Daniel Phillips. Ms. Frucht completed her undergraduate education at Harvard University, majoring in Art History with a focus in Modern and Contemporary Art. While Ms. Frucht was at Harvard, she studied privately with Lynn Chang. Before that, she was a student of Naoko Tanaka and Louise Behrend at the Juilliard Pre-College Program. Ms. Frucht has served as concertmaster of the Juilliard Pre-College Orchestra, the Harvard Radcliffe Orchestra, the Music Academy of the West Festival Orchestra, and the Juilliard Orchestra. She has given solo recital and chamber music performances at Juilliard, Alice Tully Hall, The Guggenheim Museum, National Sawdust, Scandinavia House, and Harvard University. Ms. Frucht has collaborated with artists such as Victoria Chiang, Naoko Tanaka, Alisa Weilerstein, Lynn Chang, Darrett Adkins, Paul Katz, Yo-Yo Ma, David Hardy, Ayano Ninomiya, Roger Tapping, Bonnie Hampton, Jean-Michel Fonteneau, and Violaine Melançon. Ms. Frucht has also performed with the Parker String Quartet on viola as the winner of their 2016 Guest Artist Award. An advocate of new music, Ms. Frucht is a founding member of Quartet 63, a New York-based string quartet with a particular interest in finding a balance between promoting new music while sticking to the rich traditions and styles of older classical music. Within the group, she has worked closely with composers such as Caroline Shaw, Missy Mazzoli, and Laura Karpman. 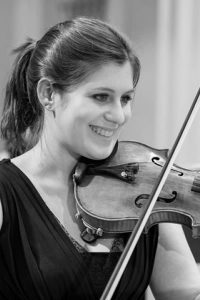 Ms. Frucht has participated in solo and chamber music masterclasses with artists such as Pamela Frank, Donald Weilerstein, Aaron Rosand, Kathy Winkler, Yo-Yo Ma, Peter Salaff, Jonathan Biss, Menahem Pressler, and The Juilliard String Quartet. She has been a fellowship student at the Aspen Music Festival, the Music Academy of the West, the Taos School of Music, and Yellow Barn. At these festivals, she has worked extensively with the Takács, Borromeo, Miró, and Brentano String Quartets. Ms. Frucht has also been an artist at the Halcyon Music Festival, and the Manchester Summer Chamber Music series in Manchester-by-the-sea, MA.